An extensive action on the look of stretch marks. Helps maintain skin texture and soothe and comfort the skin so it is better prepared to face the rapid changes that could occur to the body during pregnancy, puberty or variations in body weight. Essential body care to tone and improve skin elasticity and firmness. Made from 100% pure plant extracts, this fine, lightweight oil is recommended to prevent the appearance of stretch marks. It is also recommended during a period of weight loss. Leaves skin satin-soft and supple. Ultra-refreshing leg emulsion. Instantly soothes the feeling of tired, heavy legs. Can even be applied over stockings (non-sticky, does not stain). Natural plant extracts and essential oils. The first essential body beauty step to prevent dull-looking skin by refining and smoothing the skin’s texture. A complete multi-protection day screen for the face, offering effective protection against the harmfuleffects of UV rays, free radicals and pollution, for everlasting youthful, bright skin. Its ultra-fine texture is ideal to apply over your regular day care. 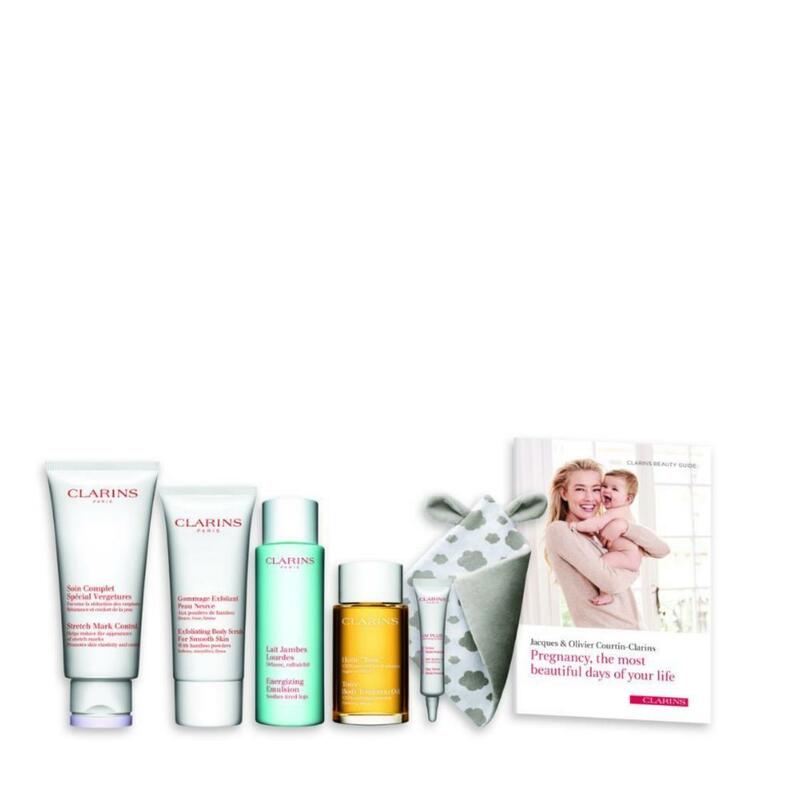 A face and body beauty guide by Clarins for women before and after childbirth.